A truly international field gathered just off the Vegas strip for the first UCI C1 race of the year. For a complete race report, including the pros reactions, check out our coverage here. StarCrossed, round two of the Cross After Dark series, moved to a new venue this year at Lake Sammamish Park in Issaquah, Washington. The race had a star studded field consisting of many of the animators from CrossVegas minus Lars van der Haar and Jeremy Powers who headed home following the race in Vegas. The new course was very fast, dry and bumpy with the only real challenge coming in the form of double sandpits the riders had to traverse every lap. A strong three-man lead group containing Ryan Trebon (LTS-Felt), Jonathan Page (Planet Bike-Blue) and Bart Wellens (Telenet-Fidea) made it’s way clear of the rest of the field in the latter half of the race. Wellens attacked the two American riders in the closing laps and held a ten-second gap all the way to the finish. Trebon ended up second a head of Page. Round three of the Cross After Dark series is this Wednesday in St. Louis at the new Gateway Cup. 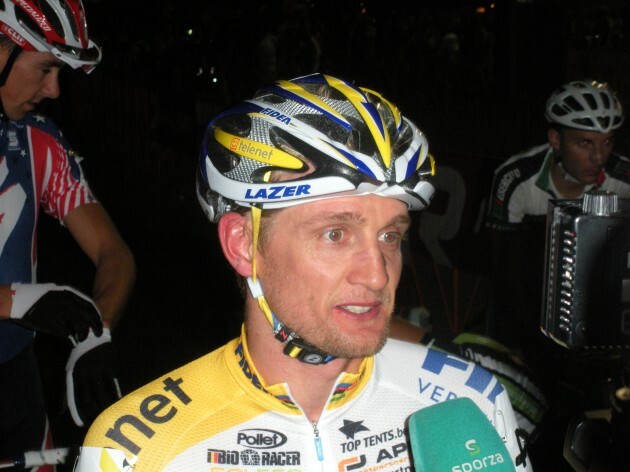 Bart Wellens and Ryan Trebon are very close in the standings of this four-race series. Trebon is not scheduled to race in St. Louis, so with a good ride Wellens could take the overall victory despite missing the final round in a few weeks. This past weekend saw two UCI C2 races take place in the heart of Baltimore at Druid Hill Park. Despite the races being in the heart of the mid-Atlantic, the podium had a decidedly international flavor. Brit Ian Field (Hargroves Cycles) took the win on day one, a head of Belgian Tom Van Den Bosch (AA Drink-Leontien.nl) and Canadian Mike Garrigan (Lapierre Canada). Day two saw a very similar outcome as day one, this time Van Den Bosch picked up the victory a head of Field. American Dylan McNicholas was able to capture third a head of Garrigan. Bart Wellens followed up his first victory of the season at StarCrossed with another impressive victory at the (formerly Rad Racing) Rapha-Focus GP. Held in the same park as StarCrossed, the course was very fast, with plenty of twists and turns to scrub riders speed. Much like Saturday’s race, Wellens set the early pace creating a three man group along with teammate Rob Peeters and Jonathan Page. Wellens made his move during the last lap of the race and was able to easily outpace Page, who was held back by Peeters. Wellens’ early accumulation of UCI points is sure to put him on the front row of some major European races next month. Round one of the new NECS series kicked off in Vermont with the Catamount GP. Frenchmen Nicolas Bazin picked up his first victory of the season a head of a very strong, New England field. Bazin arrived in the US on Wednesday to begin his American campaign. Jeremy Powers, Jamey Driscoll, Justin Lindine and Joacim Parbo were just some of the heavy hitters who headed back East after Vegas. New Hampshire native Ted King also made an apperace after a strong road season with Liquigas/Cannondale. Powers took the hole shot and quickly opened up a gap with Driscoll and Bazin in toe. Lindine continued to show that he’s a forced to be recogned with as he was the only rider able to bridge across to the leaders. Driscoll would be the next man to make his move as he attacked with four laps remaining. Powers closed the gap and right on cue, Bazin madeh is attack as thigns came back togeather with two laps to go. Powers would win the battle for second a head of Driscoll and Lindine. Steenberg Cross kicked of the European cross season with a strong field in Erpe Mere. Kevin Pauwels (Sunwed Revor) to the days top honors ahead of Sven Nys and Klaas Vantornout. Frenchman Francis Mourey suffered from a nasty crash at the start of the race and wound up a dissapointing 20th. The race was dominated by a lead group comprised of Nys, Vantronout, Pauwels, Tom Meeusen and Niels Albert – take note. Albert got a flat tire and was never able to get back in contention for the victory. Meanwhile Nys and Pauwels broke away from the rest of the lead group. Nys looked to have the edge throughout the last half of the race, but a flat a few meters before the finish line allowed Pauwels to sprint to victory – though even without a flat, Nys would have had trouble holding off Pauwels’ sprint. This entry was posted in Featured, Races and tagged bart wellens, cross after dark, Cyclocross, ian fields, kevin pauwels, mac, necs, nicolas bazin, tom van den bosh. Bookmark the permalink.